Update on the Verhojansk Russia Meteo station and data | Watts Up With That? There’s been a lot of interest in this station from my post on “pipes”. Finding it from Google Earth has been a challenge since the lat/lon provided by meteorological agencies is rather coarse. What is curious is the plume in the left of the frame. It appears to be steam but could be smoke, we’ll never know for sure. I’ve also been able to obtain the raw daily data for Verhojansk. Which has four readings per day at six hour intervals, plus the Tmax and Tmin Temperature. I’ve placed the text file on my surfacestations.org server for anyone that wishes to do an analysis and compare it to the same period for HadCRUT or GISS. Fighting a massive cold and work duties preclude me from doing any decent analysis now, but given the interest level, I’m making it available to anyone that wants to give it a go. Even though the data set is only 8 years long, there may be something interesting to discover. This short raw data set has not been processed by GHCN whereas the GISTEMP data has been. November 18, 2008 in Weather_stations. I think you mean 133.413E — not west! What a bloody shame… NASA GISS has billions of dollars to spend on computer generated climate garbage and can’t spend a few hundred thousand bucks to do some due diligence to insure their data is accurate. I wonder what year they added that convenient incandescent bulb to the screen box, and if they leave it on all the time? The Stevenson Screen photo may explain Russian “hotspots”. What type of light is shining out from inside the Stevenson Screen? Could it be an oil lamp? Does the light go off when the door is closed? I imagine that the guy in the first photo, just breathing in front of the station, has raised the local temperature! No doubt about AGW! Shouldn’t an important station be kept isolated, or are they special Hansen friends? Anthony, I think you’re right to assume that there are more than one Stevenson Screen. The unit the fellow is peering into in the top image is different from the one in the arcticphoto.co.uk image, which has some sort of device under it. The former appears to be located nearer the eastern edge of the fenced enclosure. It looks like yet another unit is just to the east of that one but is concealed by the open door in the top image, though you can easily make out the stand. Is the “newer” station not the one towards the left/rear of the bottom photo (below the plume)? Looks very similar to me. So in fact both buildings could still be standing. WOW, sure looks warm in those images, there is no doubt that heating is a serious problem there. 38 at Tampa Fl in the morning…more data on Global Warming. As usual, excellent work all round. And a good choice of words in describing the GISTEMP plot as having a positive trend (rather than a warming one) since about 1980. Just in eyeballing that graph it looks to have been fairly steady from 1900 to approx 1987 at around -15°C and since then seems to have moved up to roughly -14°C. At that gawd awful temperature, my subjective reaction is that cold is cold; one degree less cold brings little comfort. With all that imagery above as well as the snow outside my window, I need a warm drink about now. It’s a sad, sad morning when I come to work and there are no WUWT updates. I hope you feel better soon. In the photo titled “Stevenson Screen at Verhojansk Meteo Station looking ENE” there is a lovely warm glow coming out of the box. Is that an incandescent bulb? If so, is there any mechanism to make sure it is turned off after a reading? And just what is that guy in the picture doing anyway? It looks a bit like he’s taking a picture of the inside of the box, but why? Sorry to add this randomly to a post – Good to see your work getting a wider audience. The Telegraph is the largest circulation broadsheet in the UK. Yes, me too I saw that incandescent bulb! Maybe it’s there since the 80’s ! If it is left on for a day, there’s your AGW ! Well president elect Barak Obama is getting it started on climate change.He told scientist in California today we must take on climate change once and for all and wants our emmision level to be where it was in 1990.Iwrk at a smal town Ford dealership and Ican rember in 1996 every vehicle had to be ordered with Calfornia emissions which by the way an chargeable option.I just don’t understand .California has the most strict emissions and yet they have the warmest temps.Of course we know from the site, whats up with that Thanks Anthony, that most of their temps are from equipment that has been moved from original location,who knows why, or is beside an air condition exhaust fan.I guess that hot exhaust could have an effect on a thermostat .Today in North Caolina , surry county we have been in the 30 ‘s all day ,no clouds,which is about a month early than normal.Our mountains are having snow and there is snow in the eastern part of the state as well only flurries butthis is early none the less.I know natural variences.How much longer can the global warming crowd keep saying this before we say NO ENOUGH LIES something really is going on ? 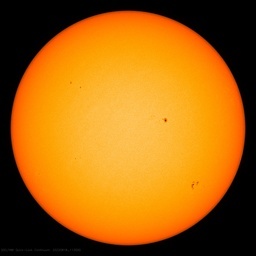 ?There is something going on .Despite the fact that we are being lied to by Noaa and the AGW crowd the earth is in fact cooling.What Obama Mccain,and the liberal media are trying to do is nothing more that the goverment controling the american people.It’s no different than Hitller. Like some previous commenters, I can see several ‘strange objects’ on the Google Earth satellite imagery, all of them can be stevenson screens or other instruments. Which is the operating one? If the thermometer is located in the temperature sehlter seen above with that nice lightbulb, it could be an explanation for the recent rise in measured monthly and annual mean temperatures. According to Mojgorod.ru, Verhoyansk (Верхоянск) has a population of about 1300, and it had only 400 inhabitants in 1897. We had a few weeks in SW Florida at the end of August his year; needed to get away from our wet windy Scottish summer. But apart from all this I got a real education watching US TV. “If Obama wants Hilarys support, she will not come for free. She comes with a big bill”. Looks like it has started already. Perhaps we should try to find a person in Siberia who can find out what is going on there… the growing Siberian internet penetration rate (now about 30%) can be a great advantage. About Stevenson screens and Yakutia tourism: I made some web reading in Russian and English. It seems that there are actually two Poles of Cold rivalling: Verkhoyansk (which at the time already had a proper meteorologic station founded at the end of 19. century by a Siberian prisoner, I think in 1892) and Oymyakon, where the temp was lower, but not measured in an official station, which was built afterwards. Both places are frost basins (translation?). Both places are trying to woo tourists by taking them to the stations, letting them to observe the temperature and then issuing “Pole of Cold” certificates. The “old” Verkhoyansk building on the arcticphoto is probably the one from the end of 19th century. I’m not sure if the photo of people peering inside the Stevenson screen is not taken in Oymyakon – I”ve seen a photo from there, which I can’t find now again and their Stevenson didn’t have anything under the booth. The biggest problem is the remoteness of this station. Verhoyansk is a very small settlement, and located far away from big Siberian cities. Yakutsk, the closest city with a population above 200-250 thousand is more than 700 kilometers away. The pipes thread identified the light switch (box upper right). The guy’s probably taking a picture of the thermometer. That’d be the best reason to travel to the pole of cold that I could think of. OT, but this is incredible and there’s no “general purpose” comment thread. Schwarzenegger has just issued an executive order directing CA State agencies to plan for sea level rise and climate Impacts. I guess these idiots won’t stop until the glaciers return to Chicago. The light bulb is an error term, unless they keep on increasing the wattage then it can influence the trend. The issue is what has changed during the last 20 to 30 years that impacts the temperature reading besides the temperature. The national lab is working with Iberdrola Renewables and other companies on measuring solar energy resources for developing solar-thermal power plants in Arizona.
. . . With better instruments and software however, the scientists can gather higher resolution data and produce more sophisticated modeling and forecasting. The SOLRMAP project aims to do just that. NREL researchers will supervise the instrument installation and data collection while participating companies will provide the funding and maintenance, Wilcox said. Each one of Irradiance’s instruments costs between $10,000 and $12,000, Wilcox said. Do they already include temperature sensing? OR could they be persuaded to add it? Robert M. Carter in his article, The Futile Quest for Climate Control, http://www.quadrant.org.au/magazine/issue/2008/451/the-futile-quest-for-climate-control, denoted three realities in regard to AGW – science reality, virtual reality and public (political) reality. While the pros and cons of AGW are being discussed by the science realists and the virtual realists, the decision has been made by the public (political) realists and that decision can only be reversed by our elected representatives, which at this time, seems futile. In making the situation more dire, the Supreme Court, in Massachusetts v. EPA, decided that the EPA should consider CO2 a pollutant, without consulting Nature. Do you feel that you are losing control of your life, losing your sovereignty and losing your freedom? If not, fret not. The feeling will soon be upon you. 44 at my house in Venice (about 1 hr south). The average temperature being 41for those two sites although neither site was actually 41but hey, averages are averages. I’ll take warming any time! You might enjoy this quotation from the website of an outfit called Institutional Risk Analytics (IRA), interviewing a Dr Janeway. The analogy leaps off the page. “Janeway: That’s my point. It was a kind of religious movement, a willed suspension of disbelief. If we say that the assumptions necessary to produce the mathematical models hold in the real world, namely that markets are efficient and complete, that agents are rational, that agents have access to all of the available data, and that they all share the same model for transforming that data into actionable information, and finally that this entire model is true, then at the end of the day, leverage should be infinite. Market efficiency should rise to the point where there isn’t any spread left to be captured. The fact that a half a percent unhedged swing in your balance sheet can render you insolvent, well it doesn’t fit with this entire constructed intellectual universe that goes back 50 years. The IRA: But doesn’t this certainty about the ability of science and mathematics to reveal truth go back to WWII and the Whiz Kids of McNamara’s Pentagon? Then we see the emergence of physics as the real leader of 20th Century scientific research. Finally, in the latter decades of the century physics is applied to finance. Janeway: Yes, but here is the problem. Real scientists tend to be much more skeptical about their data and their models, and thus tend to be critical empiricists. We can blame the crisis on failed physicists; they had all of the math but none of the instincts of good scientists that would enable them to be good physicists. For those not in the know, manbearpig is very funny. Hint #1: My 16 year old son showed me manbearpig on TV! I wonder if Al Gore has the heated pool cranked up in Nashville? Wow, this global cooling, I mean global heating is making me sweat. First, thanks for the credit for locating the buildings. Someday I’ll tell you how. Now, about the lead photo in this post. There are two specific problems. Look at the three pole power support which appears just behuind the photographer’s back pack in the photo. You can just make out the shadow of this structure under your left sight line. However, it appears to align with the right side of the building, and your sight line aligns it with the left edge. The shelter seems too close to the fence, there may be one object between, and that really doesn’t fit well either. I can’t tell if it is a bad pixel or a real object, but there seems to be a tiny object in about the right location if you draw the sight line from the right side of the building through the apparent base of the triangular shadow. Ain’t photointerpretation great? Second, what the heck do those two guy wires go up to? There is nothing in any other photograph or in the satellite photo which suggests anything that tall in that location. More questions than answers. My suspicion is that yet another screen for tourists to take photographs inside was installed since the satellite photo, and there is another new pole of some kind with guy wires there also. Where’s the linear regression line? Looks like a 1 degree C rise in annual mean temperature from -16 to -15 over the last 100 years. And this is in the super-sensitive boreal lats. Look at the sad face, utterly miserable about soaring global warming. It’s only -15. Not like the good old days. I’m in a panic about it; how about you? This made me wonder. As a complete novice … does it take the same energy to raise the temp from -15 to -14 (in a given space) as it does from 14 to 15? I guess he hasn’t seen the latest data showing sea levels have recently been dropping or that global temperatures haven’t shown a rising trend in 10 years. Why is the instrument shelter so high off the ground? I believe the official height of the thermometers is five feet. That could in effect make the temperatures warmer just being that much higher. In a dry climate like that I don’t think the shelter is high due to the depth of the snow. Maybe Arnold should have a look at this. According to this really cool weather site, (which, by the way, gives massive kudos to Anthony) it’s a balmy -44F in Verhojansk at the moment! I like the exspression on the young lady’s face. I can imagine what she is thinking. Chris D – I’m certain you are correct, there are multiple Stevenson screens. Probably three, the one in the photo from the earlier post, the one the guy is photographing (looks slightly different from the first one), and one immediatelly behind the second one where you can only see the legs. They are arranged from West to East. The one with the lightbulb may be there for tourists. The first one looked more modern and has a heavy cable going back to the station. Anyone else notice the large half of a tank just to the left of the woman’s head in the Stevenson screen photo? 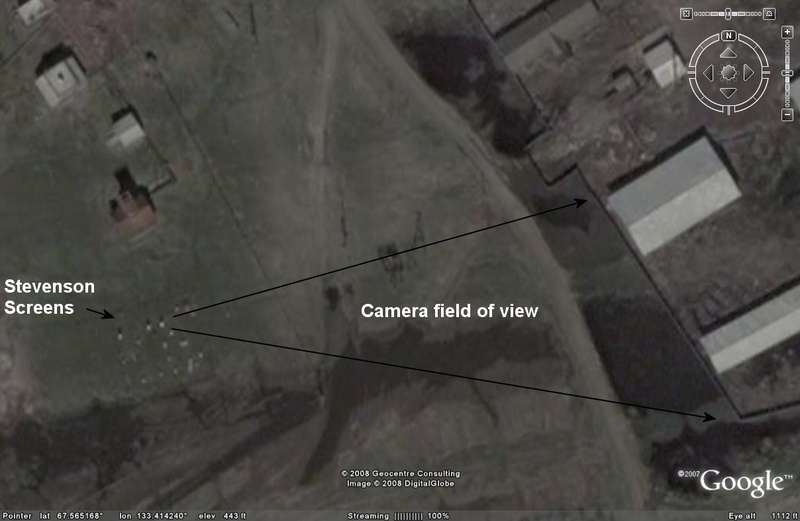 I think it is the dark spot in the middle of the upper line in Anthony’s Google Earth field of view image. Some sort of a fuel storage tank? For what? Anthony – like you, I’ve got a cold, a job, and small kids. The first should be gone in a couple of days. Once I can figure out what to do with the others, it should be fun to play with the data! The Earth’s temperature for the month of October was the second-warmest since records began in 1880, according to data from the National Oceanic and Atmospheric Administration. The month’s average temperature of 58.2 degrees was 1.1 degrees above the 20th century average of 57.1 degrees, trailing only October 2003. For the Earth’s land areas, it was the warmest October on record. And this NOAA data does include the correct October temperature data for Russia…unlike NASA’s October data released last week, which caused the agency to end up with egg on its face. After NASA announced that October was the warmest ever recorded, eagle-eyed bloggers at skeptic blogs Climate Audit and Watts up with that pointed out that the data from Russia was for September, not October. Of course, this skewed the global temperature higher than it would have been. Indeed, as noted above, even with the correct October data from Russia, temperatures across Australia, Asia (including Russia), the western USA, eastern Europe, northern Canada, eastern Brazil, and the southern countries of South America were all warmer-than-average in October. And so far this year, 2008 is the ninth-warmest year on record for the planet, with all nine of the Earth’s warmest years occurring since the mid-1990s. See post here. This is not surprising as NOAA has become the biggest outlier in recent months. They have thanks to Tom Peterson and Tom Karl a global data base that is worth nothing. There is little or no adjustment for urbanization, land use changes, no adjustment for bad station siting (69% of the 560 US climate stations surveyed by Anthony Watts team of volunteers were poor or very poorly sited), 2/3rds of the stations globally dropped out in 1990, the number of missing months increased tenfold in the FSU and Africa, and changes in instrumentation like here in the US that Tom Karl himself found produced a warm bias of 0.5F. All these introduce a warm bias, none of whoch are corrected for. Not less than 6 peer review studies have shown these issues may account for up to 50% of the warming since 1900. Trust only the satellite. In fact, this October was the 10th warmest of the 30 years of data for the MSU satellite according to UAH with only a 0.167C (0.3F) anomaly instead of the 1.1F. Unfortunately satellite data extends only back to 1979. Oh, and those pole barns in the background couldn’t possibly be there as shelters for the single most important resource in the town, namely “reindeer”, could they? Looking at the hi-res Google Maps images, I counted what could possibly be THIRTEEN large barns that could each hold at hundreds, if not thousands, of the critters within a few hundred feet of the Stevenson screens. I’m beginning to think it might not be the pipes that are causing the slight bump in the temps around Verkhoyansk (Google’s spelling), after all… It’s, quite possibly, all of those methane-passing, four-legged heat pumps snuggling down against each other within flatulating distance of the thermometers. OT – but take a look at the second floor deck and the rooftop deck at the new station in the second photo. They must be out of parallel by 2 to 3 feet. The fruits of a centralized, planned economy on display. Heat travels up. In buildings it goes up through the ceiling and up out of the roof. This is why icicles form on the edge of rooftops in wintertime. Heat from inside the building warms the roof and melts the underlying snow that’s in contact with the roof. It runs’ down the roof to the eves that have no heat source underneath since the underside of eves is open air. The melted snow freezes into icicles on the egde of the eves as it’s running off. I don’t see icicles around the bottom edge of the roof where the “newer one (station) above that has a dish antenna”. But still if there is any heat in that building at any time during the year it will change the temp readings on the roof. The plume from the other building does look like a heat source. Any wind pushing that plume toward the station will change the temp reading. It is more likely that that plume pushed by wind would effect the newer station high on the roof than the older station much lower to the ground. What I am very curious to know is when the newer station was installed. I am curious to know was it ~1995 when you can see a clear jump in temps on the graph. Not less than 6 peer review studies have shown these issues may account for up to 50% of the warming since 1900. I know of two of those studies: McKitrick/Michaels nd LaDochy (both Dec. 2007). But what are the other four? Anyone? I’d really like to get them. Most materials have a specific heat (energy required to raise the material’s temperature 1 degree) that is NOT constant, that is to say it varies as the temperature changes. So theoretically, I am confident that the atmosphere has some slight difference between the energy required it these two cases. From a practical standpoint, the difference will be minimal. Quick observation/question about temperature and low basin type places. If there is no wind you get an inversion, right? Temperature above the inversion is warmer. Now if there are heat sources in this basin the slightly warmer air will rise until it hits the inversion. It will not go any further but circulate around inside the inversion. Basically you would fill this area with air that is slighly warmer but unable to rise above the inversion. Either way you will warm up the place. So, if you have a bunch of buildings, reindeer by the thousands you will warm up the basin, slightly, along with making it smell like reindeer and hazy from smoke. Not that I’m complaining or anything but looking at the GISS temperature map Alberta is an area where we suppose to be at or below normal temperatures for October but you guessed it for us October was much warmer including record breaking temperatures the first two days of the month. This may allow more armchair station surveying! Longtime lurker. Really enjoy your site. Found some interesting attributes in the raw Verhojansk data. Appears there was some sort of instrumentation switch in June of 2004 — two data lines (db_id 2 and db_id 3) appear for each date between May 1 and June 15. Further note that the daily record of minimum (Tn) and maximum (Tx) temperatures disappear after June 15, 2004. I had thought that global mean temperatures were based on the mean of daily min and max temps. How does GISTEMP calculate annual mean temp in the absence of recorded minimum and maximum temps? Could the apparent change in equipment or a shift in how monthly mean temperatures are calculated have contributed to the apparent spike in temperature between 2004 and 2008 in the GISTEMP graph? 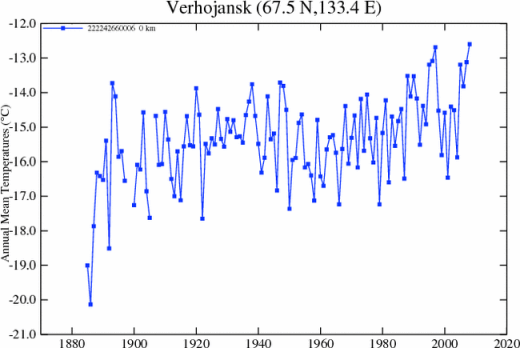 The following page shows temperature graphs for Verhojansk (link). Data from HOAA and HadCRU. The graph of monthly data indicates cooling summers and warming winters. The final graph on the page compares Verhojansk with Ojmjakon, which has a very similar trend over the last 50 years. Another perspective of the original meteo station office in your 4th photo. But is co2 already at a tipping point? Caveat: It is Hansen of GISS claiming this. No surprise. In the paper they say that we can reduce CO2 50ppm by “reforestation of degraded land and use of more natural fertilizers.” Shouldn’t those be goals already, regardless of AGW? “an interpolation scheme from nearby station data”: is that ‘nearby’ in the technical sense of ‘may be hundreds of miles away’? It allows to download archives in csv text files if you click the floppy disk icon next to “Данные с метеостанции”. I am a native Russian speaker, let me know if you need any assistance with this. If there will be a global survey of the Waldo region in Siberia, here’s some more pics for a start. The last historical photo shows Ms. Kisileva (who worked at various Siberian stations in the 50’s and 60’s) at the Oymyakon station. In January, it would that be that dark around mid-day wouldn’t it? That far north, perhaps lights inside the screens are a necessity during the winter months so that the oberver can see due to the nearly perpetual darkness. I wonder if a screen design incorporating lights is/was a Siberian standard prior to moving to an automated system. I also imagine it would take a minute or two for the observer’s eyes to adjust in order to take the readings right next to a glowing light bulb, having just trudged about 50 (SWAG) meters in the near dark – long enough to heat things up a bit. These images beg a whole host of questions, don’t they? And then there’s Mosher’s interesting comment above about using 7 different sites for the one record. This is off topic but should be a good fodder for another post. The video is very scary but even more frightful is the statement “But Obama could begin to tackle global warming without Congress through administrative actions.” Someone should tell Mr. Obama the science is NOT “beyond dispute” and that most of the “facts” he regurgitates from Al Gore’s “A Convinient Lie” have also been refuted. Why the requirement for man-made forests? In the interest of historical environmentalism, shouldn’t we be burning Iowa every year so as to restore the prairie grass environment? California is leading the way in restoring their fire-cleared savanna. Some people would find 59 C rather distressing. “Not less than 6 peer review studies have shown these issues may account for up to 50% of the warming since 1900. Maybe you can ask them because they provided the comment. For your information reindeer are not kept in barns. Even just a few miles away can be very different in terms of weather and climate. It’s all about topography. Interestingly whilst GISS is reporting a positive temperature anomoly over Siberia, the “Times (19/11/08)” Weather Eye, reports that the Siberian town of Oymyakon had a low of -47C this week. Apparently “several degrees below normal”. I’m intrigued by the immense temperature rise that occured in the mid to late 1880s. I could understand a fall there, possibly caused by Krakatau’s 1883 erruption, but a rise of such magnitude is surely improbable? Pole barns commonly store hay. I’d suspect reindeer feed. Don’t forget that Siberia covers a very large area. Local anomolies also occur commonly, for instance the USA on any given day will have record lows and highs for a particular day somewhere or other. At least you know now it wasn’t the pipes. Those screens look pretty well sited too, even category 1 perhaps. I’d also suspect it may have been the photographer who put the light in the box in order to get a better photo. Photographers do these kinds of things. In any event a bulb wouldn’t affect a mercury thermometer reading unless it was left on for a little while, which is unlikely, since It takes all of 2 seconds to get the reading and write it down. Even if it is actually there and is on constantly, that would show in the data as a step change, not a continuous rise. Back to the drawing board I think. REPLY: Actually it could still very well be pipes…depending on prevailing winds and the amount of BTU’s dumped in the town by the heating system and open windows due to no regulation, there may very well be a UHI heat plume that extends to the station. Anthony, it’s been very interesting to see the Verhoyansk station get located and pretty amazing to see how public information can be utilized. There is way more leverage on non-US data than US data. It would be particularly worthwhile to get first hand information on other very high leverage Russian stations. I’m in the processing of collating a list of stations that contribute to GHCN updates (it’s much smaller than the entire network and actually smaller than USHCN) and I’ll send you the list in a day or two. I argued long and hard with Ray Ladbury on RC about the significance of your photos, especially the ones with air conditioners, so I’m certainly not anti. But a hot pipe a hundred yards away in an environment of -40 is really pushing it. With a strong wind in the right direction you might get a rise of a fraction of a degree. But then again, any wind out there in Winter would probably have a very severe cooling effect. And you’re looking for several degrees of anomaly. I don’t see it. And I’ve been as skeptical of that Russian data as anyone else in the past. Frankly it’s always looked like Russian data was pushing the entire global warming trend but now that I see their stations are quite good I’m beginning to wonder. And Russians have nothing to gain by data manipulation since they are more pro-oil than anyone and their scientists are mostly extremely skeptical. The old argument about scientists putting in colder data in the past to squeeze money out of the Soviet regime isn’t credible either since it’s quite clear they got free heating. And even if they hadn’t they’d have risked being shot or sent to a Gulag for that. I’m pretty sure they’d put on their furry hats and go out there in -40 to faithfully collect the correct data day after day. I certainly would have in their shoes. REPLY: I’m not suggesting single pipes 100 yards away are the big difference to what happens inside the screen. What I AM suggesting is that we have a significant city-wide active UHI driven by a power/steam/hot water plant. Let’s say you have a steam/hot water plant that puts out 5 megawatts, which given the size of the power plant I see in the photos, (the building with blue roof here) it could be a reasonable guess…thanks to the piping system, that heat dissipates over the entire town. In a small town like this, that gives a fairly well concentrated heat source. It doesn’t matter if the pipes are buried or above ground, the heat will dissipate into the area. Wind will distort the heat plume downwind, as we’ve seen from other UHI studies. So even a weather station on the edge of town (as this one is) could be affected. Now look at the size of the Russian town – a couple of square miles, dissipate 5 megawatts over a couple of square miles…that is bound to raise the local air temperature some. Back of the envelope calcs: 2 (square miles) = 5,179,976.22 square meters or about a forcing of 1 watt per square meter. That is significant. So if this city wide dissipated heat means the regular difference between -30C and -25C for example, a 5C anomaly will show up as bright red in the GISTEMP analysis, but it will still be bitterly cold…there will be no visible effects, snow and ice will still stay in place (except maybe over/under heat pipes). Then there is humidity. Depending on how much water is lost from the system in the area can also be a factor. As we know from Christy’s study of the San Jaquin Valley, extra night time humidity can effect Tmin Again with a lot of water vapor being put into the air that may affect the temperatures. Note the plume in one photo on the left side within the station viewshed. UHI from waste heat and waste water vapor doesn’t have to be “warm” to create an anomaly, and we are talking about temperature anomalies here that are subzero. Without some good data on the powerplant, the town, and the state of the system it will be hard to pin down exactly. But, as they say on Mythbusters: “I think it’s plausible” that we have a UHI effect in Verhojansk. That set me thinking. What does the mean of max and min tell anyone anyhow? Doesn’t the length of time that a temperature persists throughout a day count for anything? Consider a typical Indian Summer Fall day in the midwest. It might start with overnight lows in the 50’s and warm up to 70 degrees F where it remains for most of the day. Then, along about, say, 10:00 pm, a clipper could come through and drop the temperature to let’s say 20 degrees F. The mean for the day would be 45 degrees F but really, the bulk of the day was mostly in the 60-70 degree F range. I’d argue that the better characterization of the temperature for a given day be the time weighted average average for the max and min temps. I’ll have to ponder all this a bit more but thanks for setting off down that path. Should read, “I’ll have to ponder all this a bit more but thanks for setting me off down that path.” (I don’t think you were headed that way. ) Thanks again. Some additional comments on this site. The Google view is apparently from 2005, according to the press release about the future competetive Indian service. So, this could explain why several of the abjects apparent in the various ground level photos do not appear in the satellite photo. Anyone know how to access current satellite photos? Finally, the absence of snow on top of some of the enclosures is puzzling. Two possibilities, the light bulb stays on. Or, some poor thermometer reader has to sweep it off every hour. I’ll bet they would opt for MMTS in a heartbeat. Before we head down this rat hole would it not be easier to just stop cutting down the existing rainforest? Oh right, since it’s mature it is not a net sequestration so no carbon credits. Guess we need to plant new forests then and let the old ones go… gotta get those carbon credits. How can these looneytoons in one breath say farming causes GHGs and in the next breath say we can cure GHGs with tree farming. Sheesh. Thanks Anthony. That argument makes sense. An FE thermal model would indeed tell us the truth. I could likely do it too if it weren’t for this pesky need to earn money. The aim of this study was to reconstruct stand structure and growth forms of Larix sibirica (Ledeb.) in undisturbed forest–tundra ecotones of the remote Polar Urals on a centennial time scale. Comparisons of the current ecotone with historic photographs from the 1960s clearly document that forests have significantly expanded since then. Because thousands of more than 500-year-old subfossil trees occur in the same area but tree remnants of the 15–19th century are lacking almost entirely, we conclude that the forest has been expanding upwards into the formerly tree-free tundra during the last century by about 20–60 m in altitude. Maybe its just me, but I looked at that data set you posted. If you start at around 1900 (when the data is actually pretty clean and error free) going until the present you get to me what looks like the ordinary. Using yearly averages, the overall average for the time frame is roughly -15 degrees celsius. If you run a 5 year trend line you see that it starts off above average, moves down to below average and moves back up to above average today. But, during the entire timeframe the moving average is + or -, 1 degree. In fact the moving average is showing that we are now heading back down towards cold again. How is this not normal. I would assume the person reading the temp comes up and turns on the light just before doing the reading. Looked at the daily trend data for the last 8 years. The min and max data is only for the first 4 years. A trend on all the ave temp data using the max min data was -2.1 C/yr. Using only the March to March data it was -3.125 /yr. Using the eight years of 4 times a day observations gives a trend of +0.3 C/yr, the March to March 4 times a day observation for the eight years gives a trend of -.84 C/yr. Doesn’t match the end of the yearly plot very well. Will look at the other data set. Obviously the GISS corrections change the data trends. Sure looks strange. If anyone from GISS, NOAA or RC is reading this can you explain why there is such a big difference. Fred4D, thanks for doing this. Can you share your method and or files, such as an Excel file or other tool? I have no idea if the method is correct, I have no background in metrology. For the all daily data i just graphed the entire T column, in the spreadsheet linked in the story, versus a summation of the date and time columns and got the linear trend line. For the March to March I obviously cut of the end of the data past March. For the average of the Max and min I just averaged the max and min data for each day then plotted versus the date. This would have been easier if I had sorted the data to collapse the Max min data, but I just cut and pasted an average formula. For most of the data there were four hourly observations and the max min so it was regular, near the end of the four years there were more than the 4 daily observations. Like two 6 am observations with slightly different temperatures, Some days were missing data as well. I think the time frame, even 8 years, is too short to make too much of the trends. The difference in the GISS data I do not understand, but then I do not know what they are correcting for. I would assume correcting for altitude and such would give more of a constant change in the numbers not the decreasing correction seen. Looking at the every 6 hour data it looks like data is not collected automatically especially since it appears that more midnight data is missing than others (would have to check to verify that), When they were doing duplicate data for each observation it is like they were changing thermometers or station sites perhaps and wanted a little bit of time to overlap the data to check for consistency. The table above shows the Average, Max, Min and StDev of the differences for each recording hour. The worst correspondence is for the 18:00 observations. It could be if these are different locations there is a shadowing that affects the 18:00 observations but not the others. I think I have looked at this data enough. Strangeness abounds. Why the double readings? Why the changing GISS correction. Why does this data show no change over time but the GISS data shows warming? Do enjoy reading your articles, especially on the weather station sites. During the time period after the double readings stopped (6/14/04 on) there were not fewer 0:00 readings as I supposed in my last post but more 6:00 readings (6 more to be exact) than the 0;00, 12;00 and 18:00 readings.